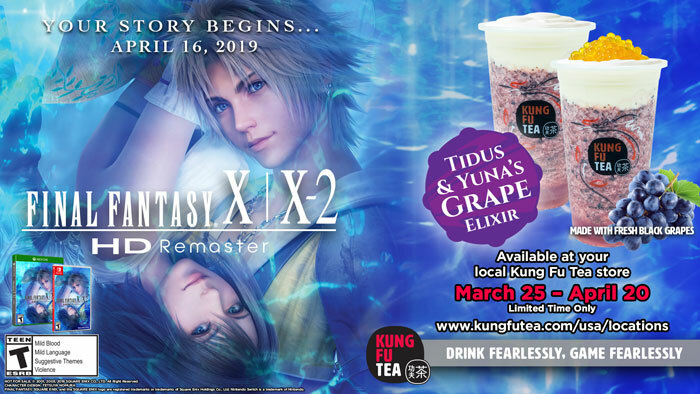 [North America] FINAL FANTASY X/X-2 Themed Beverage Hits Kung Fu Tea Locations Nationwide! 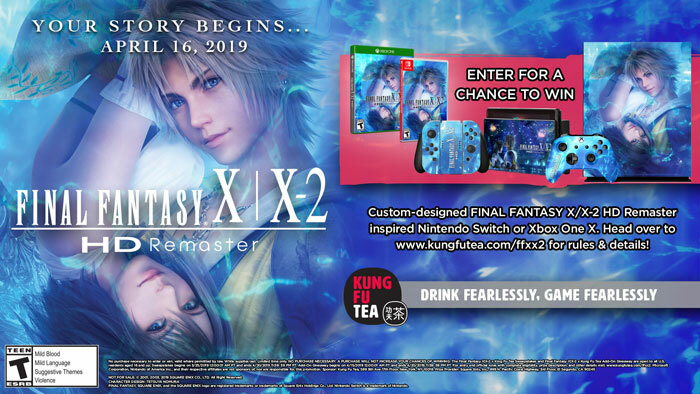 Making its debut on the Nintendo Switch system and Xbox One on April 16, FINAL FANTASY X/X-2 HD Remaster contains both FINAL FANTASY X and its sequel FINAL FANTASY X-2, both renowned for their emotional stories and stunning graphical quality. FINAL FANTASY X follows the story of Tidus, a star blitzball player whose fate intertwines with Yuna, a beautiful summoner, as they embark on a pilgrimage to save the world of Spira from the endless cycle of destruction brought on by the mysterious being known as Sin. FINAL FANTASY X-2 takes place two years after the events of FINAL FANTASY X, following the stories of Yuna, Rikku and Paine in their adventures as sphere hunters during the long-awaited Eternal Calm. Founded in Queens, NY on April 30, 2010, Kung Fu Tea is a made-to-order beverage chain with over 200 locations across the U.S. and several in Canada, Vietnam, and Australia. At Kung Fu Tea, each beverage is freshly handcrafted with authentic, high-quality ingredients. The brand's founders, baristas, and customers are Kung Fu Masters—passionate, dedicated, and fearless in changing the face of the beverage industry. In 2018, Kung Fu Tea founded the world’s first National Bubble Tea Day, taking a huge step toward spreading the bubble tea culture around the world. Visit www.kungfutea.com to learn more.